Dominion Energy Inc.'s request to build a modestly sized — though less modestly priced — wind farm goes before regulators today, as evidentiary hearings begin on the two-turbine, $300 million Coastal Virginia Offshore Wind project. If all goes as planned, the project would come online in 2020, becoming the nation's second offshore wind farm and the first to go up in federal waters. Sited 27 miles off the coast of Virginia Beach, the turbines would add 12 megawatts of capacity to the state's grid. But Dominion, along with its industry allies and Virginia officials, see the demonstration as a steppingstone to the state's new goal of developing 2 gigawatts by 2028. "[T]he project needs to be built and studied to determine how the technology works and performs in the Atlantic Ocean 27 miles off the coast, and in potential hurricane force winds," said David Botkins, a spokesman for the company, which is partnering with Denmark-based Ørsted Energy A/S on the project. 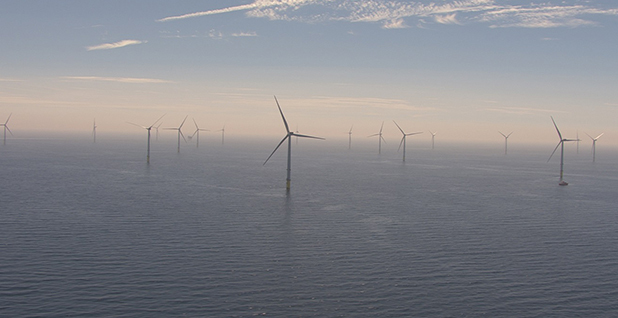 "One of the basics in launching the offshore wind industry in the U.S. is transferring the experience from Europe," he said. "But there are limitations to how much of that experience can be transferred." This week's hearings at the State Corporation Commission come after a preliminary session Thursday, when lawyers for environmentalists, Dominion and the attorney general's office attempted to reassure the SCC's three commissioners that they still enjoyed some semblance of authority over the project. Virginia's General Assembly had put its "thumb on the scale," they acknowledged, by passing a grid-modernization bill last spring that pronounced the construction or purchase of solar and wind facilities — and in particular, offshore-wind pilots of up to 16 megawatts — to be "in the public interest." But that didn't obviate the need for the SCC to perform a prudency review — an evaluation of whether the $300 million price tag was justified — they said. "The General Assembly wants this type of generating resource," said Will Cleveland, an attorney representing the Sierra Club. "It clearly knows" the 12-MW offshore project "is not the lowest price available for any kind [of power]." The question for the commission, he said, was whether the proposed costs were reasonable for a "generic project of this type." A 'tipping point' for industry? Not so long ago, the fate of the project was hanging in the balance. In 2016, Dominion lost a $40 million Energy Department grant after saying it couldn't guarantee completion by 2020 and had to reassess whether to move forward. Still, the state's maritime industry, centered in Norfolk, might win it a spot in the hearts of offshore developers, especially as more and more of them look to invest in the U.S. Turbine installers, meanwhile, would find infrastructure already linking the open ocean and inland waterways, highway and rail. And ships transporting tall pieces of equipment wouldn't have to worry about fitting beneath bridges on their way out to sea. By mid-decade, said a BVG Associates report commissioned by the Sierra Club in September, demand from Virginia could precipitate a new wave of Eastern Seaboard projects, including in Dominion's North Carolina service territory. The 28,000 shipbuilders and repairers who work in Virginia, meanwhile, would make up "a deep and rich pool of experienced maritime steel-working talent" for turbine-building companies to tap. "In our scenario, Virginia provides the tipping point" for European manufacturers interested in establishing facilities on the Atlantic Coast, said the consultancy.